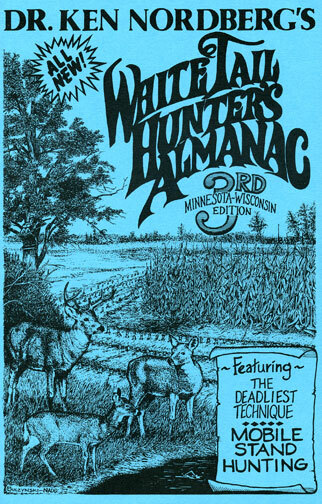 1970 was the year I began more than five decades of hunting-related studies of wild whitetails. 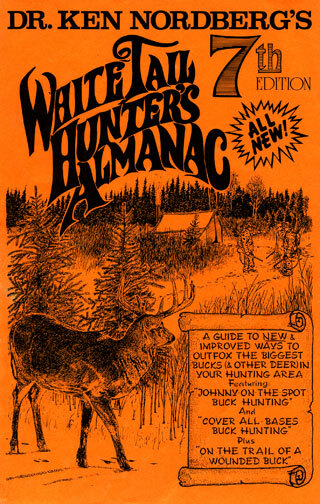 It was also the year my three sons, two daughters and I began hunting antlered bucks only. Since then we have tagged more than thirty yearling bucks (most taken between 1970 and 1989), more than ninety 2-1/2 to 6-1/2 year-old bucks and one 7-1/2 year-old buck (very few bucks survive their seventh winter). Many now grace walls of our homes. 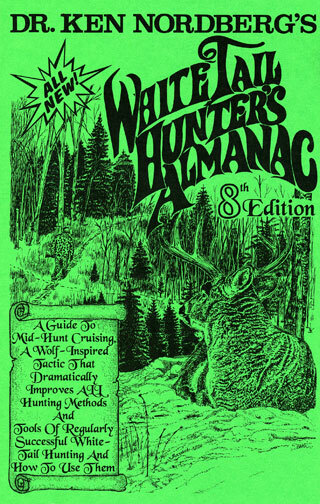 How we hunted the seven notable bucks pictured below covers the gamut of what I have been sharing with other deer hunters in books (9), magazine articles (more than 700) and seminars (hundreds) since 1980, my goal always being to enable others to experience the very best of whitetail hunting like my hunting partners and I have long been experiencing since 1972. 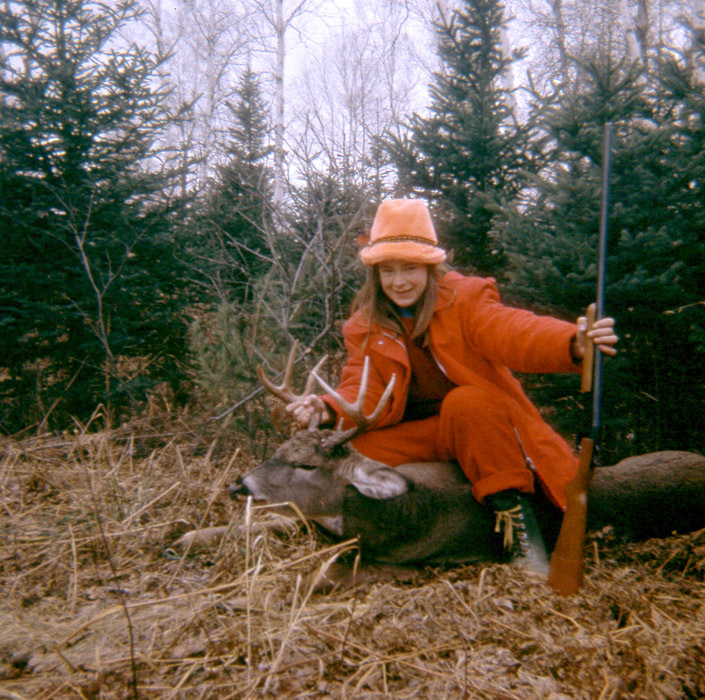 My 14-year-old daughter Peggy's big 10-pointer (picture) was taken in 1973 at a range of 25 feet from one of my first primitive treestands, a year after we were first beginning to recognize the advantage of using elevated stands. 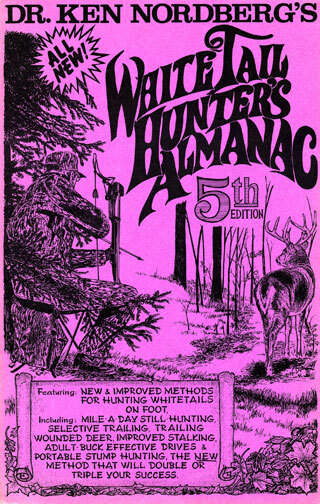 At that time I only knew of two other hunters who used elevated stands, husband and wife bowhunters who had taken bucks two years in a row while seated on stout branches of pine trees. 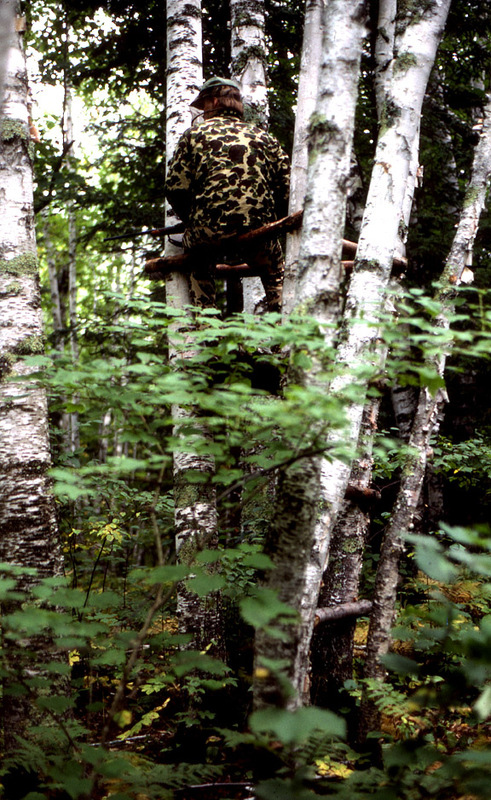 This photo is just one of hundreds of our early Nordberg' tree stands. 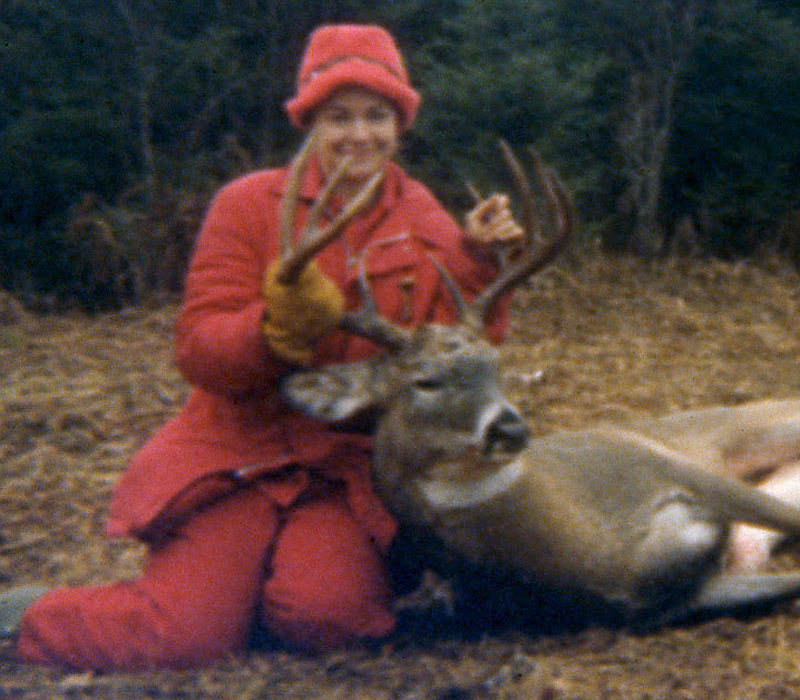 Peggy took her first buck in 1972, an unsuspecting 9-pointer standing 11 feet away from where she was seated six feet above the ground in a toppled popple tree. Sites for Peggy's first two stands were selected by me while scouting weeks before opening weekend, my first intention being to create comfortable places for Peggy to sit a safe six feet above the ground (stand hunting). At each site she was given strict orders to remain in her stand until I returned to lead her back to camp. Back then I most feared allowing my young children to wander alone in our vast wilderness hunting area, a region in which several older and more experienced hunters had become lost and were never seen again.. My second intention was to give Peggy the best possible chance to take an antlered buck, the only whitetails that could be legally taken in Minnesota at that time. Being yet unsure how to identify whitetail feeding areas, Peggy's elevated stands overlooked much-traveled deer trails obviously favored by older bucks - made evident by notably larger deer tracks, antler rubs and ground scrapes. Back then I made sure at least one ground scrape was within sight of every elevated stand, having yet to learn scrapes are not particularly productive for buck hunting during the two week period in November when 85% of does old enough to breed are bred. Under similar circumstances today, it is doubtful Peggy would have had a chance to take either buck because she was fully exposed at both stand sites. Back then whitetails seemingly never looked up into trees in search of danger, even while passing hunting Nordbergs who could have reached down and touched them as they passed (incredible but true). Whitetails back then were not intimidated by a human's odors unless they could also see and/or hear the hunter at ground level. 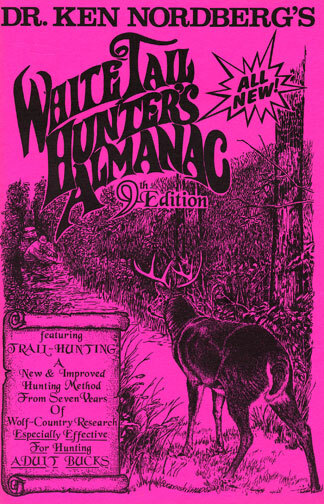 By 1989 when treestand hunting had reached a zenith of popularity, this whitetail shortcoming was declining. Many older bucks and does were then routinely looking up into trees for hunters and the heyday of easy buck hunting with gun or bow was coming to an end. My son John's latest trophy-class buck, a beautifully marked 8-pointer with heavy antlers (picture), was taken on the sixth evening of our most recent firearm hunting season (2012). 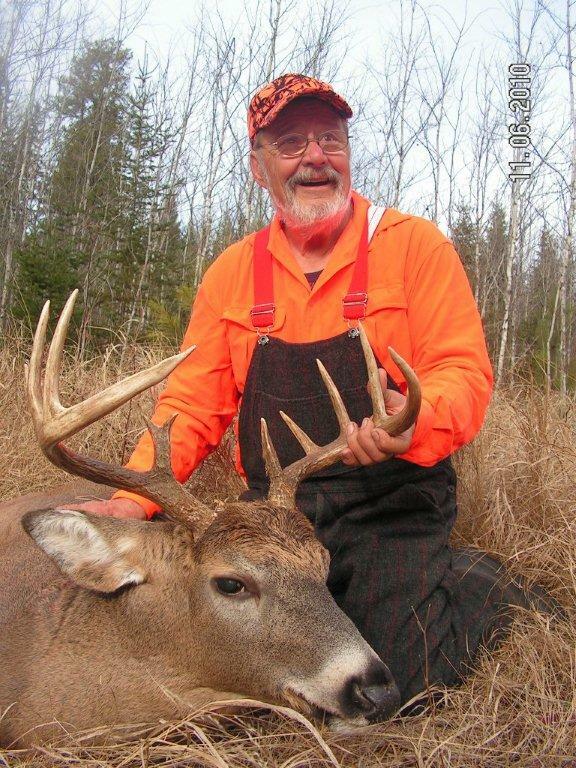 John had the site where he shot this buck in mind for an entire year, discovered during the previous hunting season. While scouting last October, he and I selected an approach route to this site, using fluorescent tacks to mark a series of connecting deer trails. About 100 yards from our destination we discovered a natural "stop-short" blind, a dead, rust- colored evergreen leaning against the wide trunk of a mature oak. It would provide excellent cover for John while seated on his backpacked stool. 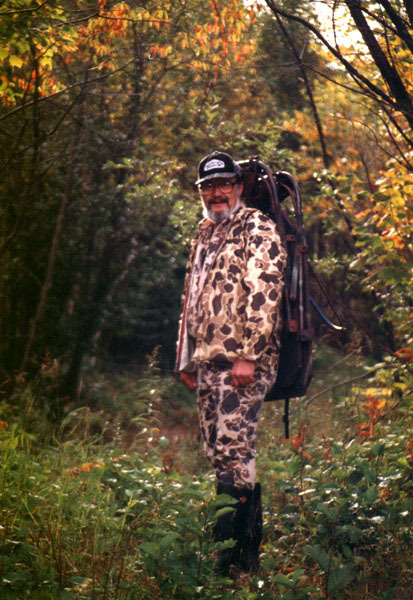 John felt such a stand site was needed there because in the area ahead he had unexpectedly "jumped" deer several times during previous hunting seasons. This stand would give him the opportunity to study the area ahead undetected until certain no deer were in or near his path before proceeding to his intended stand site. At the end of our new trail John had two choices: select a stand site overlooking the southeast corner of a vast new clearcut in which dozens of nearby sugar maple stumps bristled with red saplings, almost certain to become a favorite whitetail browse area in November, or a narrow strip that had been logged 200 yards eastward from the corner of the clearcut between a stand of mature white pines and a spruce bog. Formerly a favorite feeding area of whitetails inhabiting this area, this treeless strip was still red with osiers, another much favored browse plant of our northern whitetails in winter. Fresh, four-inch-long deer tracks drew John to the corner of the clearcut. Being devoid of deer during the Thursday evening he sat there, however, he finally decided he had selected the wrong spot. Minutes later he slipped silently into a patch of young spruces beneath the towering pines where he was well hidden while seated on his stool (his exposed head masked by his camo headnet) about 20 yards back from the edge of the narrow strip. 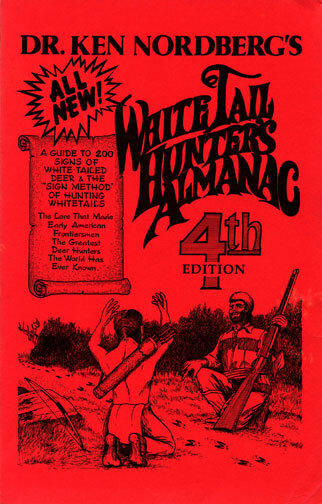 A half-hour later every whitetail hunter's dream began to unfold, beginning with the sudden appearance of three does leaping toward John from behind a hidden embankment on the near edge of the open strip. The does walked without pause past John on his right only 10 yards away, heading south. Hoping a buck was trailing them, John kept his eyes on the spot where the does first appeared, rifle ready. And then it happened, just like we all dream it will happen: a beautiful buck with impressive 8-point antlers suddenly leaped into view, following the path taken by the does. When it halted due east of where he sat, John fired. The buck immediately dropped to the ground, after which a fourth doe suddenly broke from cover about twenty yards behind John and bounded noisily past in the direction taken by the three does. "Wow," John muttered, finally taking in a breath. My son Dave's big buck was taken under similar circumstances nineteen years earlier. While scouting near the top of a massive hill (Dave named it "Acorn Mountain") three weeks before the opener, he discovered a well-traveled deer trail full of hoofprints and droppings obviously made by a big buck. The nearest end of the trail was about 50 yards southwest of a little 30-foot-diameter opening at the beginning of an irregularly shaped, ten-acre area full of stunted and much ravaged red oaks. On the ground among bright (freshly made or renewed) antler rubs seen in almost every direction were heavy branches recently pulled down from the oaks by black bears impatient to feast on acorns. Figuring the other end of the trail likely ended at the big buck's bedding area, Dave decided the north side of a dense line of young balsam firs next to the little clearing would be a perfect place to wait in ambush on opening morning, that is if the wind blew in any direction from the west. At 5:30 AM that morning a gentle breeze was blowing from the southwest and miniature snowflakes were tinkling down through frozen branches above as Dave cautiously made his way up the east side of Acorn Mountain. Upon arriving at the little opening, Dave spotted freshly made, four-inch-long hoofprints in the light snow blanketing the familiar trail. The buck was obviously in the red oaks at this very moment. Dave tiptoed to his right, silently placed his stool on the ground behind the young balsams, sat down, pulled his camo headnet down over his face, cap on top, and placed his rifle across his lap with his gloved right thumb on the safety. At first light, 6:30 AM, Dave heard what he thought was a deer walking north (through dry leaves) out of sight west of his stand. At 8:10 AM, he heard similar rustlings directly south of where he sat. Something was heading his way. After silently easing off his safety, Dave waited, rifle up, hardly daring to breath. Whatever it was, it suddenly halted a short distance away. Unbearable minutes passed without a sound. And then, as silently as a puff of smoke, a 300-plus-pound buck with wide and heavy ten-point antlers stepped into view from behind an evergreen tree on the opposite side of the little opening, only ten yards away. At 8:15 AM I heard a single far-off shot, obviously a 7 mm. Magnum, somewhere in the northwest quarter of our hunting area. 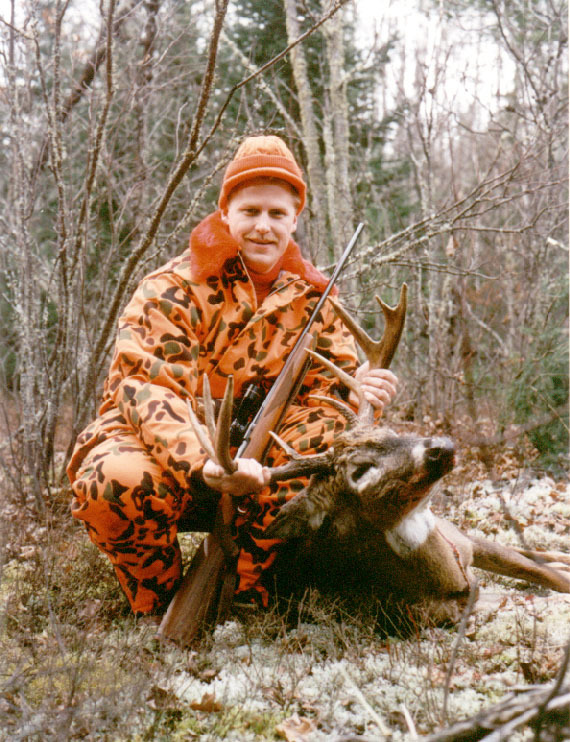 Some Nordberg yet unknown had taken a big buck (we never fire at lesser bucks so early in a hunting season). Our deer camp would be a happy camp at noon this day. Doc's son Ken with his massive 2012 8-pointer. 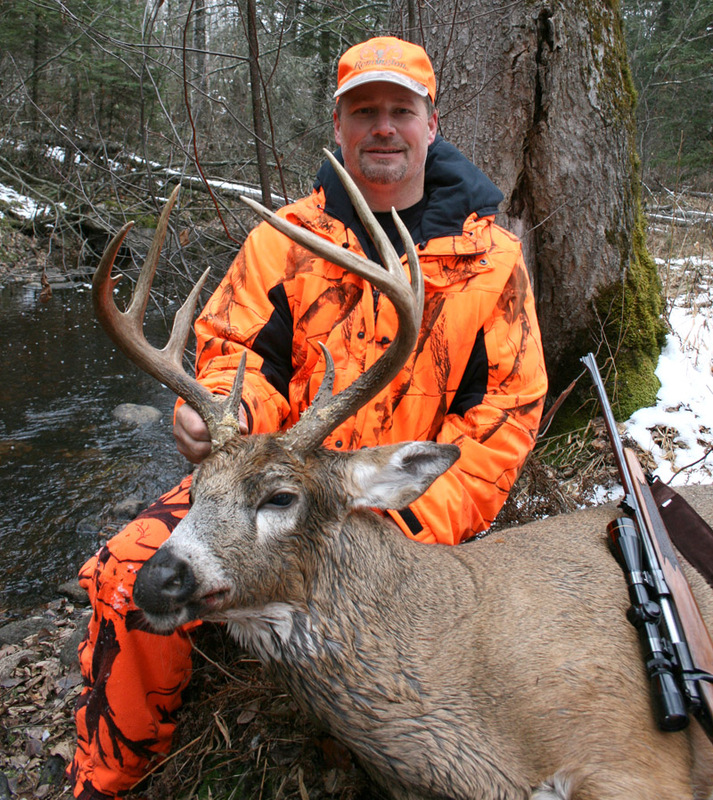 The largest buck taken by a Nordberg during the past 23 years (likely a record book buck) was an 8-pointer taken at a picturesque spot by my son Ken on the second morning of our past firearm hunting season (2012). This buck was shot from a treestand. 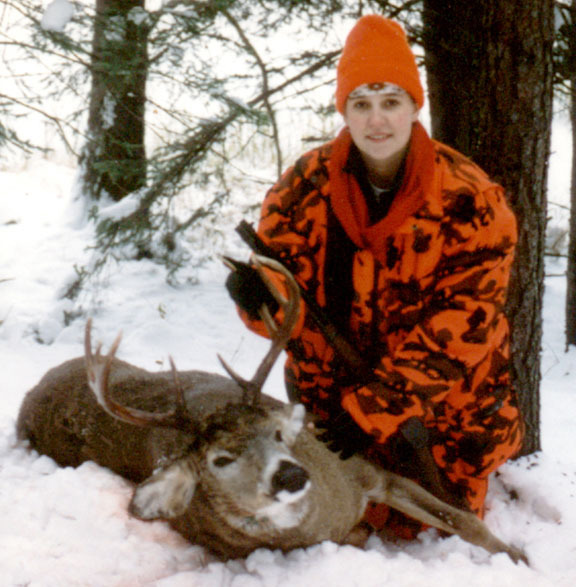 Throughout the years we have hunted in our current hunting area, Ken has been remarkably successful at taking bucks at stand sites he selected entirely on his own. Most sites were located in very dense forest cover adjacent to feeding areas. He has tagged mature bucks on five successive opening days in a row at two successive stand sites (10 bucks in 10 years), one stand overlooking a wet lowland loaded with red osiers and the other overlooking a wide stand of red oaks. This was an unusual achievement considering the fact that very few stand sites remain productive for taking big bucks as long as five years in a row. 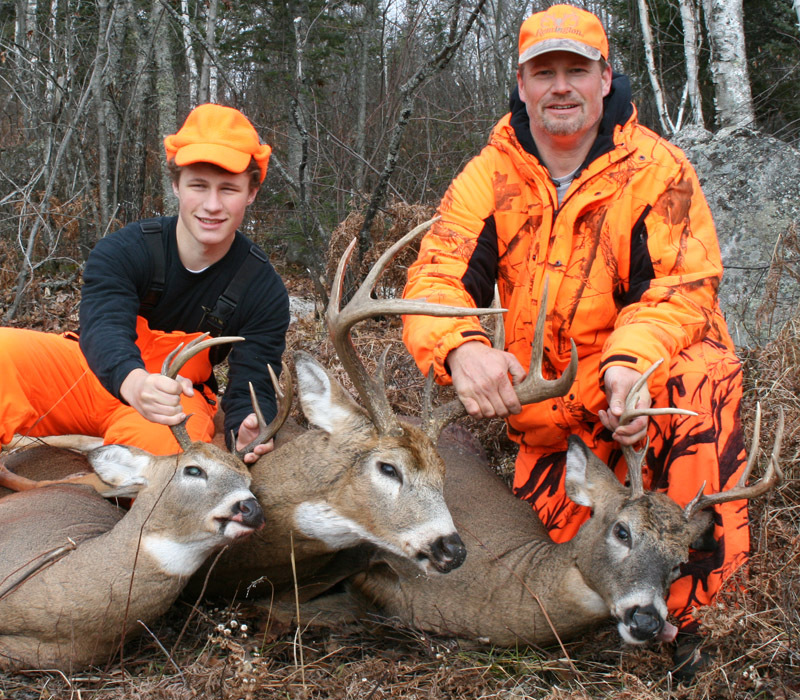 Until last season when he took three mature bucks (party hunting), he generally settles for one mature buck per hunting season taken at a stand site never used before, a formula that has long been recognized as best for hunting big bucks by all hunters in our deer camp. 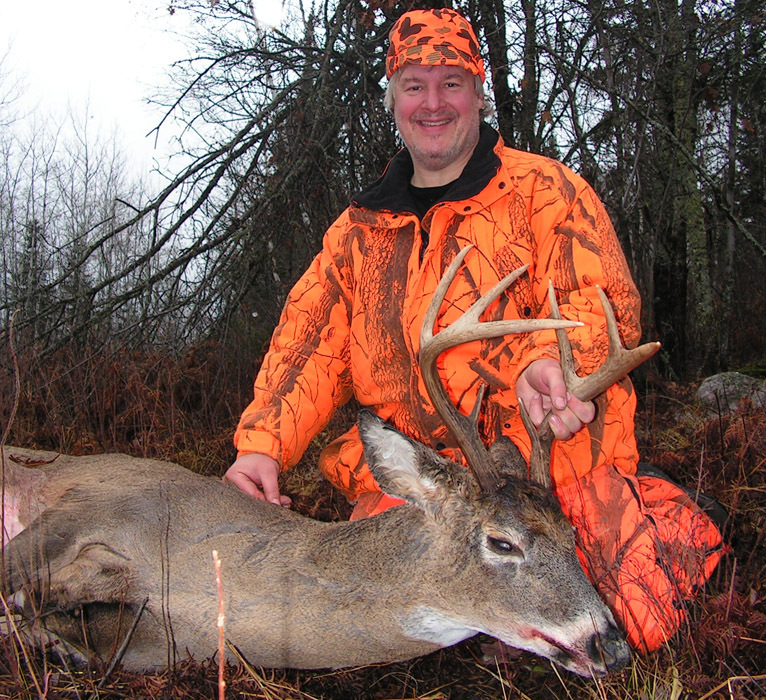 Ken is skilled at recognizing buck stand sites with several solid reasons for hunting there. Take the stand site where he took his outstanding buck last November. First of all, it overlooked a newly discovered spot where many whitetails often forded a fast-running stream. I've found several creek crossings during my 67 years as a deer hunter, but I've never seen one that could compare with this one. The trail was unusually wide and beaten down on both banks of the stream. Second, on the opposite side of the stream is the base of the steep slope of a high hill. I've known quite a few white-tailed bucks in many parts of North America that preferred to bed near the crests of such hills, spots that provided a wide view of the area below and speedy escape routes down steep and wooded slopes on opposite sides of the hills whenever necessary to flee from dangerous creatures struggling upward toward them. A third good reason for hunting there was the stream itself. Older white-tailed bucks rarely bed a great distance from water, being reluctant to travel far for drinks of water during the antler-growing season (May through August), likely for fear of injuring their yet soft and tender antlers, their key to gaining dominance and the right to breed. Fourth, behind Ken's stand site on his side of the stream was a new clearcut, typically an area that will provide all whitetails living within a mile with the most abundant and nutritious of wild foods for a period of three years, sometimes more. Fifth, the frosting on the cake was, one of the deer that regularly crossed that stream had four-inch-long hoofprints and inch-long droppings, obviously a big buck. The only thing wrong with the site was a lack of adequate ground level cover on the slope beneath the mature timber within easy shooting range of the much used crossing on Ken's side of the stream. Ken decided a tree stand was the answer to this deficiency. As silently as possible, the gurgling stream below likely masking any worrisome sounds he made, he placed his portable nine feet above the ground among dense boughs of a 40-foot-tall balsam fir, backed by several equally tall balsam firs. These trees providing more than enough cover to keep his silhouette from being sky-lighted and identified by deer below. 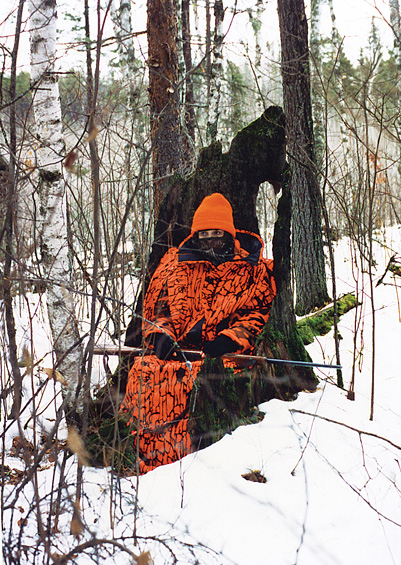 In front, his camo-blaze-orange clothing would blend well with dense evergreen boughs that arched past his tree stand. With all this going for him, Ken could hardly wait for the beginning of the hunting season. Unfortunately, the wind was blowing from the southeast on opening morning, making it unwise to approach his stand along the only quiet trail leading to the site, coursing northwest. If he had made an attempt to head to his stand regardless, his airborne scents spreading widely out before him would likely not only ruin his chance of taking that buck that day, but if indeed discovered via airborne odors by that buck that morning, his chance of taking it during the entire hunting season could have been ruined as well. Knowing this, Ken elected to hunt at a different never-used-before stand site that could be approached from crosswind. At 4 PM that day he took a 3-1/2 year-old 8-pointer, field dressing it while a pair of gray wolves watched from a hillside about 100 yards away. The wind blew from the southwest the next morning, at last enabling Ken to head to his much-revered treestand overlooking the ford without fear of being smelled by the big buck. Ken's son, Ryan, headed to a nearby stand where he would be handy to tag the big buck if Ken was successful (a legal party hunting procedure). It didn't take long. Shortly after first light the biggest buck Ken had ever seen in the wilds, an 8-pointer with unusually tall, heavy and wide antlers with bases bigger around than a husky man's wrists, walked without the slightest show of caution to the ford and dipped its head to drink. At the shot, the buck dropped into the stream. Ken then scrambled to the ground and raced to the water to retrieve his buck. Much too heavy to haul alone up the steep bank on his side of the stream, with extreme effort he managed to drag it up onto the lower apposite bank. Tomorrow morning you are going to get a big buck," I said to my younger daughter, Katy, over our evening meal in camp meal years earlier. Kate smiled and asked, "How do you know that?" "On the way to camp this evening I came across two fresh trails of deer in the snow," I began (as I recall). "The deer were headed toward the sickle-shaped feeding area (full of red osiers) that wraps around the western end of that spruce bog up the hill from that first big beaver pond north of camp. Not being alarmed, they'll very likely feed in the same place tomorrow morning. One of the deer was big, having hoofprints including dewclaws measuring six inches in length. The other deer was smaller, having hoofprints including dewclaws about 4-1/2 inches in length. The bigger deer was trailing the smaller deer and dragging its hoofs in the snow from hoofprint to hoofprint, meaning the smaller deer was a doe in heat and the larger deer was a dominant breeding buck, probably one for the wall. Does are only in estrus 24-26 hours, so when fresh tracks such as these are found, we can't mess around. We've got to hunt those deer as soon as legally possible. "According to our weather radio," I continued, "a light wind will be blowing from the south in the morning.. About 5:30 AM I'm therefore going to lead you to a big hollow stump in which you can sit on your stool and watch the major deer trail that courses north from the north end of that feeding area. I'm then going to go to a spot about 100 yards south of the south end of that feeding area and sit down on my stool. Not too long after that you should get that buck." "How can you predict that?" you might ask. When certain a buck or any other deer is located in a certain area, most deer hunters would be likely to set up a drive with one or a skirmish line of several upwind hunters attempting to push the deer toward one or a line of stationary hunters downwind. Experienced adult deer, especially older bucks, almost routinely recognize when a drive is being set up and escape by flanking the drivers or standers before the drive begins or while it is in progress. Experienced bucks are also likely to lie down where they will be difficult to spot between passing drivers, making their escape after the drivers have passed. If I had attempted to drive that buck and doe toward Katy, the two deer would have reacted as all experienced whitetails react when driven downwind by humans or wolves. They'd bound downwind but soon veer right or left (in this case right, into the spruce bog) and then begin fleeing into the wind to avoid via smell expected ambushes ahead. After that they'll likely abandon their ranges for awhile and/or become completely nocturnal, feeding, watering and breeding during nighttime hours only. To keep all this from happening, I simply sit down upwind, my scents then spreading out as they drift downwind and becoming a wide fence line consisting of human odors only. It wouldn't take long for experienced whitetails to realize the source of my scents had become stationary, not moving right or left or advancing toward them (scents becoming stronger). They'd then soon realize they need not fear me and resume feeding, likely checking now and then (via smell and hearing) to make certain I had not began moving toward them. They likely wouldn't depart from the feeding area until they had eaten their fill. Upon departing, however, they would certainly not travel upwind toward me. Instead, they'd move somewhat cautiously away from me, downwind, at least for awhile, likely long enough to move within sight of an undetected, well-positioned downwind hunter like Katy. Upon hearing Katy's shot at 10:30 AM, I leaped up and headed back toward her stump via my roundabout route. Directly downhill from where she sat, I came upon the trail of a fleeing deer -- distances between its clumped hoofprints notably short with sprays of fine droplets of blood spread widely over the snow on both sides of the tracks. The trail to this deer would be short. "First came a fork-horned yearling buck," Katy excitedly explained. "I knew you wouldn't want me to shoot that buck so I didn't move as it passed. Then came a doe. I didn't see the big buck until the doe passed and disappeared behind me. I didn't move until the big buck stopped right over there (pointing at the deer trail 25 feet away) and turned its head away from me to look back. Quick as I could, I cocked my gun silently like you taught me and aimed at the buck's chest. But when I fired, it ran away. I was so excited. I hope I didn't miss it." "You did fine," I said with a proud grin. "It was shot through both lungs, The buck went down next to a beaverhouse down by the pond. It's a beautiful 10-pointer. Let's go take some pictures." This was one of a dozen mature bucks we Nordbergs have taken while using this particular hunting tactic. We call it "the gentle nudge" (fully explained in Whitetail Hunters Almanac, 5th Edition). The seventh buck of this collection of true hunting tales is the big 12-pointer I tagged three years ago, now mounted on the wall directly over my head as I write this. When John and I walked into the area where this buck was taken, three weeks before the hunting season began, it only took a few minutes for me to decide this was where I wanted to be on opening morning if the wind was right. The main feature of this site was a 100-yard-long section of an old logging road not yet overgrown with trees. It coursed north and south between very dense, 8-10 foot-tall black spruces on the east side and equally dense deciduous trees with a number of 40-60 foot-tall evergreens growing among them on the west side. The narrow opening was blanketed with tan, four-foot-tall grasses and a few small patches of red osiers and wickedly-thorned dewberry canes. Down the center of the narrow opening was an unusually-wide, much-trampled deer trail. A narrower but equally-trampled deer trail connected with it near the south end of the opening coursing from the east through the dense young spruces. At the intersection of the two trails was a very recently renewed ground scrape (black dirt pawed ten feet to one side) more than four feet in diameter. About 75 yards north of the scrape was a still-damp antler rub on a 3-inch-diameter popple tree. Whereas all of this might seem reason enough to decide to hunt there, it was the fresh and old, four-inch-long hoofprints (not including dewclaw prints) and one-inch-long clumped droppings that excited me most. The two trails and the areas around them were full of such tracks and droppings (no beds), indicating a big buck, likely a 10-pointer, had been spending a great deal of time there. Every time I have hunted near such a spot in the past, I had either taken a big buck within hours or should have taken a big buck within hours (I've screwed up a few times). I selected a stand site a few feet in front of the antler rub behind a six-foot spruce tree, intending to face south while seated on my stool, peering between the dense boughs of the tree. The tall grasses behind me would do a great job of keeping my silhouette from being sky-lighted or snow-lighted. After stamping down the grasses where I planned to sit, I turned to John and said, "Now let's get out of here. The less long-lasting human scent we deposit around here the better. I hope," I added, "I have enough fluorescent tacks left to mark the route I must follow to get this new spot in the dark during the hunting season. We're a good two miles from camp." At 9:14 AM on opening morning a southwest wind was blowing and obviously increasing in velocity. Leaves of a nearby red oak were now occasionally clattering with gusto. A 20-mile-per-hour wind was forecasted for this day. Once it exceeded 15 miles per hour, every whitetail in the region would likely remain hidden until evening in secluded bedding areas. Disappointment now seemed inevitable. But then, quite suddenly and unexpectedly, standing broadside at the spot I had been watching for more than three hours, the intersection of the two trails, was an enormous buck with wide, multi-tined, ivory-tipped antlers. Forthwith, I found myself peering through my rifle scope with the crosshairs centered a bit high and a bit forward of the middle of the buck's neck where it joined with its body and my right index finger was squeezing my trigger. At the thunderous report, the buck dropped out of sight. Though my accounts of hunting these seven bucks are much condensed, each includes prerequisites my hunting partners and I now consider "absolutely essential" when preparing to hunt mature bucks. Knowledgeable scouting is number one, including knowing what to look for and then preparing to take full and quick advantage of what certain deer signs mean, especially tracks and droppings. We never waste time hunting where there are no tracks and/or droppings very recently made by big bucks within easy shooting range upwind or crosswind, places where such bucks are near right now or soon will be, this morning or this afternoon. You likely noticed our preseason scouting is routinely completed 2-3 weeks before hunting begins. This insures intended quarries necessarily alarmed by our thorough scouting will be back in their ranges doing predictable things during predictable hours at predictable places when hunting begins. The scouting that made it possible for Katy to take her buck took place during the hunting season, something we Nordbergs routinely do daily after day-two of a hunting season, having learned (from wolves) how to this without alarming our quarries enough to make them abandon their ranges and/or become nocturnal. You likely also noted, all but the big bucks my son Ken and my daughter Peggy took were taken while we were sitting on backpacked stools at ground level hidden by natural, unaltered cover (natural blinds) at never-used-before stand sites — our very best, much-proven kind of stand site for hunting big bucks. Also note, all stand sites used after the year 1989 were chosen because we had considerably more than one good reasons to believe a big buck would be taken there. After hunting seasons began, skillful approaches from downwind or crosswind, the patience and ability to sit fairly still up to 5-6 hours and accurate shooting under pressure made each hunt successful. They could not have ended as they did without these three hunting skills. Keep in mind, though everything you have learned from these brief accounts is very important, they are only the basics. There is truly much more to learn.